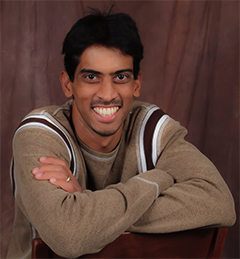 Poopalasingam Sivakumar is an Assistant professor in the Department of Physics at Southern Illinois University Carbondale since Fall 2015. He received his Ph.D. in Experimental Atomic, Molecular, and Optical Physics from the University of Oklahoma in 2009. He then continued his research as a post-doctoral research fellow at the Delaware State University. Dr. Sivakumar’s research is mainly focused on high-resolution spectroscopy techniques for bio-medical, and biological, and environmental science as well as fundamental understanding of laser-matter interaction phenomena. The invention of the laser has opened a new era for modern spectroscopy. Albert Einstein originally proposed the stimulated emission from atoms in 1917 that gave birth to the laser technology. Its applications are tremendous. The new field of laser spectroscopy originated after the invention of the first optical laser in 1960. The unique properties of laser light and spectroscopy tools made a major impact in fundamental scientific fields as well as applications in industrial, environmental, biological, bio-medical, defense, and in many other fields. Not only does the Laser Technology lead to advanced applications, but it also sets a multidisciplinary research approach that is well suited for the younger generation to pave ways to explore science with great enthusiasm. The field of a laser is rich in fundamentals of science, and its applications are tremendous. In Dr. Sivakumar’s research laboratory, high-resolution laser spectroscopy is used to study the biological system with a special focus on early detection of cancer cells. Please visit Dr. Sivakumar’s website for more information.